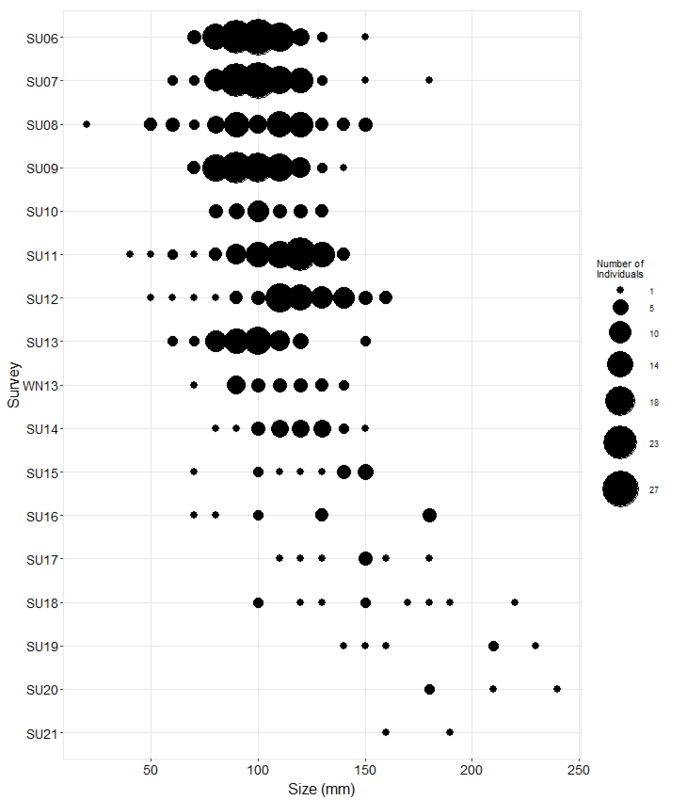 Chthamalus/Balanus percent cover in barnacle plots at Slide Ranch remained consistently high (>73%) during the survey period with the exception of a dip to 55% in 2009 when Porphyra occupied 21% of the substrate. Bare rock consistently accounted for around 20% of the cover in each year. The diversity of invertebrate taxa was low in barnacle plots with only limpets and Littorina spp. occurring in appreciable numbers. Littorina abundances ranged from 1385 to 4867 per plot. Counts were an order of magnitude greater than those observed at nearby sites Santa Maria Creek and Bolinas Point. 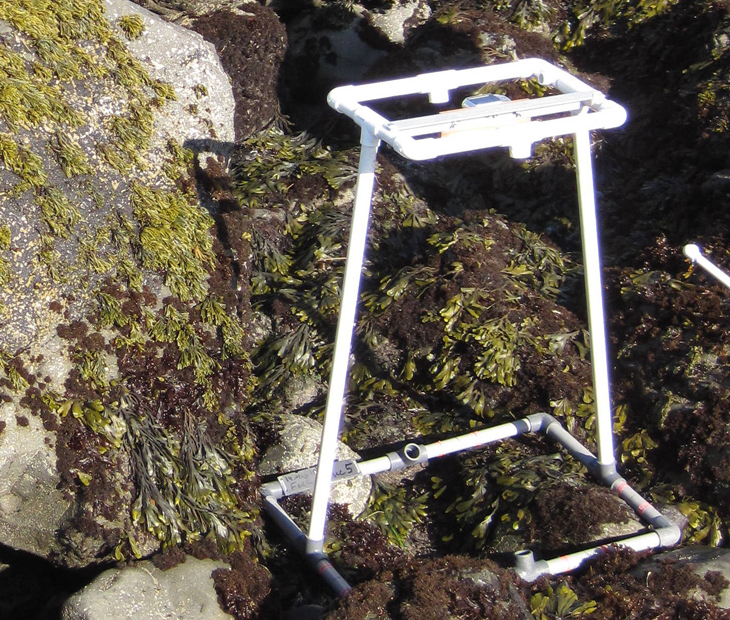 Limpet counts in barnacle plots showed no striking temporal trends with counts ranging between 24 and 80 individuals per plot. Mytilus californianus cover in mussel plots was high with a gradually increasing monotonic trend from 92% (2006) to 95% (2010). This pattern of continuously high mussel cover is similar to the trends observed at Santa Maria Creek and Bolinas Point which are nearby Long-Term Monitoring sites also located in the Gulf of the Farallones. This stretch of coastline is afforded some protection from strong winter northwest swells by the Point Reyes Peninsula. 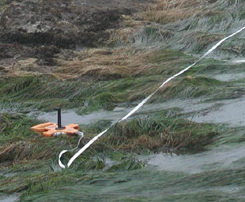 This protection may contribute to the lasting integrity of the mussel beds. The numerically dominant motile invertebrates observed in mussel plots were limpets, Littorina spp. and Nucella spp. Limpet and Littorina abundances were both higher at Slide Ranch than they were at either Santa Maria Creek or Bolinas Point. Limpet abundance was very high (686 limpets per plot) in 2006 then dropped to nearly half that number (375) in 2007 and subsequently remained fairly constant for the remaining three years. Littorina abundance mirrored the pattern observed for limpets with high abundance in 2006 (187 per plot) then dropping to 83 in 2007 with an even steeper drop to 20 in 2008. Counts rebounded somewhat in 2009 and 2010. Endocladia cover in Endocladia plots at Slide Ranch dropped considerably from a high of 52% cover in 2006 to a low of 15% in 2008 with a slight recovery to 38% in 2009. Barnacle cover was the reciprocal of Endocladia with high Chthamalus/Balanus percent cover when Endocladia was low and vice versa. Bare rock was the most common cover type when Endocladia or barnacles were not present for all years except 2006 when Mastocarpus spp. occupied 10% of the substrate and rock was just 6%. The numerically dominant motile Invertebrates observed in Endocladia plots were limpets, Littorina spp. and Nucella spp. Littorina abundance was considerably higher at this site than Santa Maria Creek and Bolinas Point. Counts of Littorina increased fourfold between 2006 (822 per plot) and 2010 (3240 per plot). Limpet abundance showed an opposite trend from Littorina with sawtooth abundance fluctuations trending from 368 per plot in 2006 to 158 in 2010. Nucella spp. counts were highest in 2006 and 2007 exhibiting an abundance trend similar to that shown by Nucella in Pelvetiopsis plots. Surfgrass (Phyllospadix) cover at Slide Ranch was reasonably stable with a slight decline from 75% in 2006 to 56% in 2010. 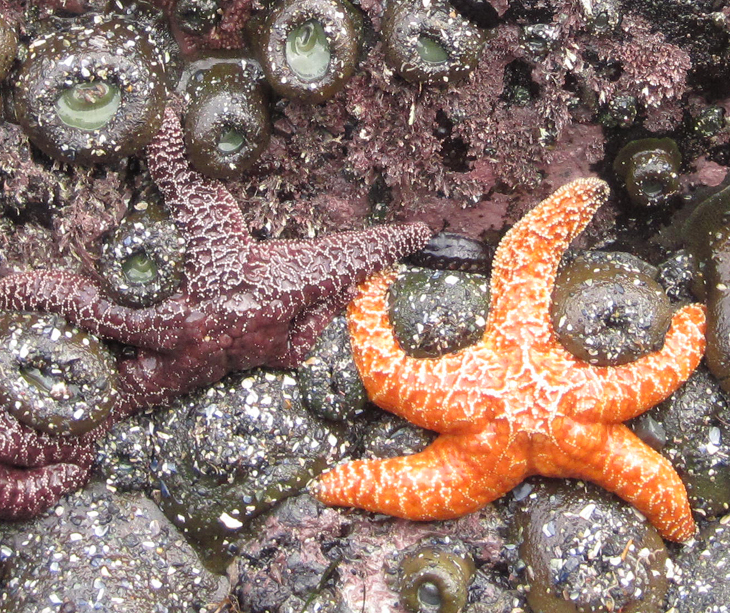 Pisaster (Ochre Star) numbers were reasonably steady from 2006 through 2009 with a large drop in 2010. No significant shifts in Seastar sizes were obvious with a modal size of around 100mm in each year. Since few small seastars were observed, the high numbers could not be explained as recruitment events as was observed at Santa Maria Creek.